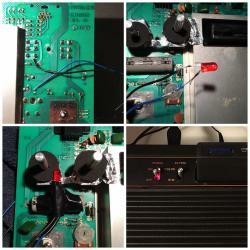 Here's a quick power LED mod I did for my 4-switch woody 2600. It's not pretty but it works so far. 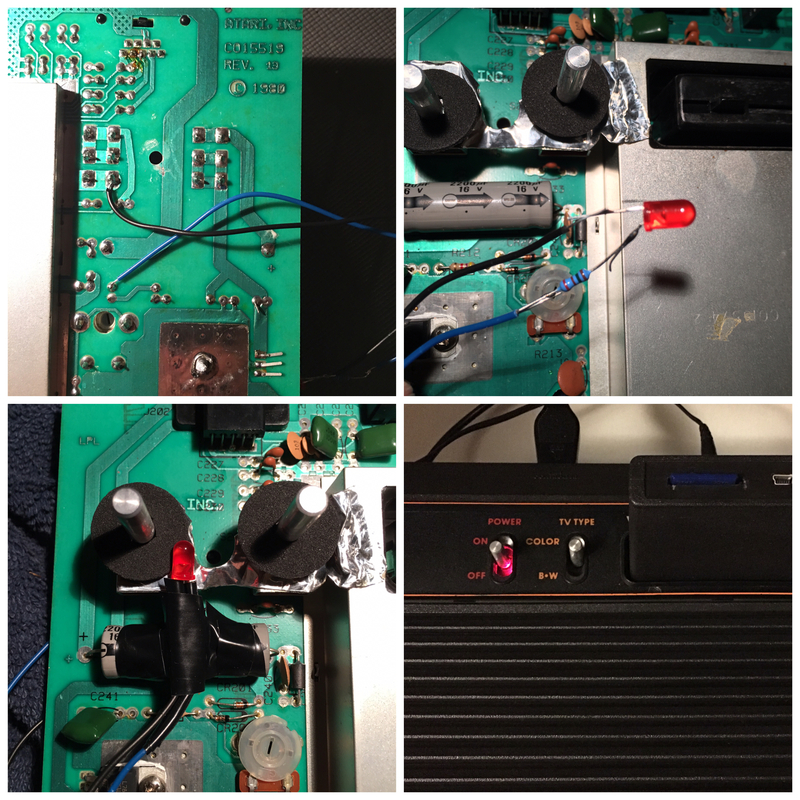 I didn't want to mess with the original look of my Atari, so I chose not to drill a hole at the top or through the power switch itself. I used a 150 Ohm resistor and used the 5V and Ground on the main board. I didn't want to solder directly to pins 2 and 3 of the voltage regulator but I could have done that instead. The short pin on the LED goes to Ground. I also made sure the wires did not touch the 'heat plate' surrounding the voltage regulator, which can get very hot. Edited by rednakes1, Mon Oct 24, 2016 9:57 AM. Yeah this is actually a great idea! Thanks, yeah I'm sure someone had thought of it before. I've only seen threads with the normal panel-mounted LED and the one where the LED was actually drilled into the switch knob itself - which is pretty clever but I'd be scared to do it myself. This mod of mine doesn't show the actual LED through the gap for the switch; all you see is a bright red light. I like it. Recessed and indirect diffuse lighting looks cool here. Atmospheric and moody if you turn the room lighting down I bet.